THE GALAXY EXPRESS: Cover Revealed For ENEMY WITHIN! Cover Revealed For ENEMY WITHIN! 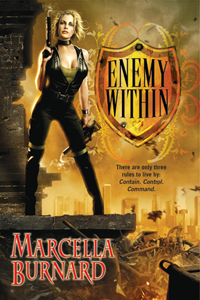 Marcella Burnard's science fiction romance ENEMY WITHIN isn't available until November, but the author recently posted the cover on her Web site. I think the color scheme works beautifully, and check out all that mayhem unfolding in the background. Sweet. Overall, it has a kind of urban fantasy feel, which I imagine is intended, but her weapons say military/space opera SFR. Given our recent discussion on science fiction romance covers, what do you think about the one for ENEMY WITHIN? Does it convey the balance of romance and tech that will help brand the subgenre?